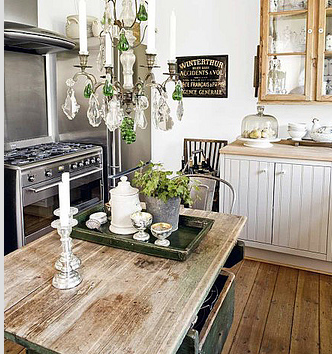 Grownup Wishlist: The Dream Kitchen / Hey, EEP! Some newly working women dream of wardrobe enhancements, designer shoes or a great leather bag upon receiving their first paycheck. Rookies. Now that I've officially joined the work force full-time, I have a few dreams of my own. However, my coveted items are a bit more permanent and much more satisfying. (At least for me). Since I was a wee-one I've recognized certain products to be "grownup only" supplies for the modern kitchen. Small appliances, staple furniture pieces and unique design elements, in my mind, are typically reserved for big-kids who have "a place of their own"...and a salary. I'm still not 100% "grown-up product worthy", but love dreaming about my "dream kitchen" and what it might look like in the next 3-10 years. 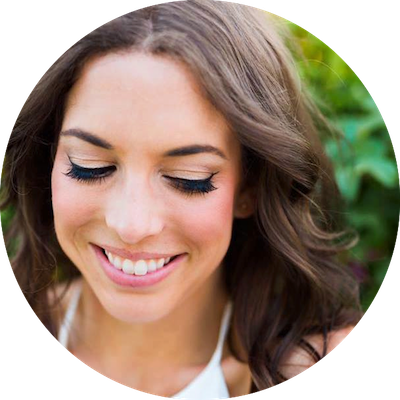 Maybe growing up isn't that scary after all :) Since my dear friend Carrie & I will be moving into our new "place of our own" in a few short months, I've decided to share the things I aim to add to our kitchen and the small changes you can make in your own. I've divided my fantasy kitchen into little dreams (realistic additions we can make in the next year) and BIG dreams (additions reserved for 25 years and up). 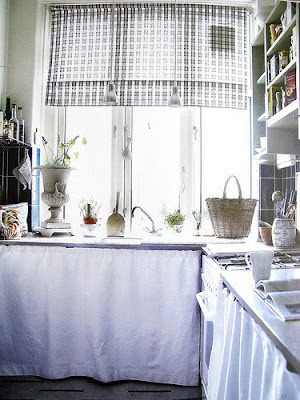 Your kitchen is a space that needs to be accessorized, just like any other room in your apartment! Give it a little TLC. Let us start with a little dream that is very tangible: mason jars. There's something about sticking all of your pantry items in mason jars that looks completely rustic to my eye. It's uniform, practical (see-through glass lets you see what's inside and when to restock) and surprisingly cheap. Skip the Container Store, if you're going to buy mason jars in bulk try shopping somewhere like a hardware store or even a cooking supply store. The key is you want to find somewhere that sells them by the flat. If you're in the city, Broadway Panhandler has 'em for a great deal. You can also purchase them online. For $10 a flat, mason jars are a perfect way to revamp the look of your space. 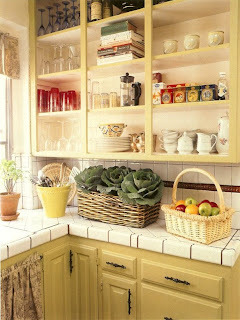 Along with the mason jars, I adore the look of opened cabinets in a kitchen. This is SUPER easy to do if you live in a rented space. If you have those nasty wooden cabinets in your tiny kitchen, open them up, unscrew the hinges and carefully remove the cabinet doors. Make sure to wrap them in a garbage bag and store them someplace where they wont be scratched or banged up. You'll have to put 'em back up when you leave but at least you can enjoy beautiful opened cabinet for the duration of your lease. If the insides of your cabinets are cruddy, consider painting them with a bright lacquer paint or lining the bottom of the shelves with oil cloth. Alrighty, little do-able dream #3 colorful paint. There is no reason why we should be stuck with dull white kitchens! Pick a few different paint samples that are inspired by your favorite vibrant foods. 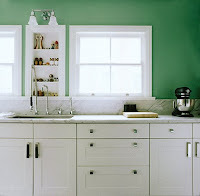 I'm partial to relentless olive green, spearmint, arugula, cherry tomato and spinach white by Shermin-Williams. Paint a whole wall, just the ceiling or make a fun pattern. If you're like me, you're going to be spending most of your time in the kitchen anyway. You might as well make it stylish place to be! And now for the not-so-realistic. 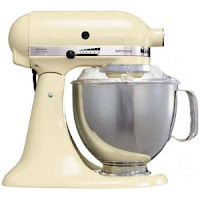 Since high school my mom has promised me a KitchenAid stand mixer if/when I get married; till death, or broken kitchen appliances, do we part...For the past 5 years I've been using her old stand-mixer that is officially half a decade older than I am. She's a trooper. Despite her broken paddle, she still whips up goodies at least 4 times a week. Hey, it's better than nothing! Deep down, I know the wait will be well worth it. 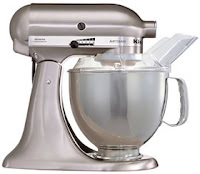 For those of you who don't know about Kitchen-Aid's stand mixers, they're the creme-de-la-creme of kitchen gadgetry. Like ipods, cellphones and sports cars, your Kitchen-Aid can be customized in a number of different colors. Choosing a favorite is nearly impossible! There's the creamy yellow, mint green, light blue, baby pink or the classic brushed stainless steel. Too many options! 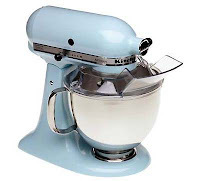 On top of that, you have to choose between your bowl capacity and whether or not you want the mixer that has the tilt-back head or the crank that raises the bowl. How is a girl to decide? Good thing I have a lot of time to decide. 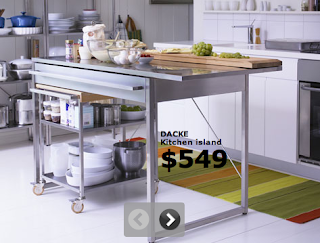 Next on the list do-able list, a medium-sized dream, the kitchen island. You don't need a custom built kitchen to enjoy a gorgeous island these days. 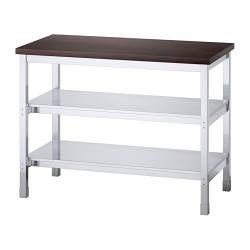 Search Ikea's website, or even JCPenny's, for sturdy counters at a great price. They come in anywhere from $150-$600, in stainless steal, aluminum or wood. I advise looking for one with wheels, this way you can rearrange your space to suit your day-to-day needs. You can find no-frills prep counter at online restaurant supply stores. 1. 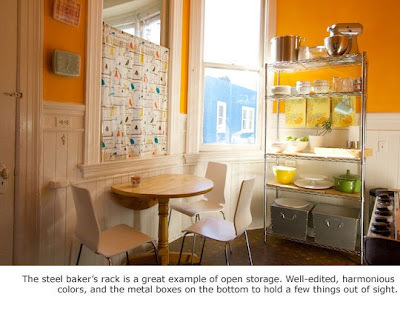 Extra workspace- often times small apartment kitchens lack the counter space for you to prep your ingredients. How do you roll out pastry crust in a 10 x 12 space? 2. Extra storage- stick big bowls, pots and pans under the island and leave your cabinets open for pantry items! When you have as much kitchen crap as I do, you need all the space you can get. 3. Extra dining space- don't have a table for everyone to sit at? Pull up some stools and use your island for countertop dining. Moving on. 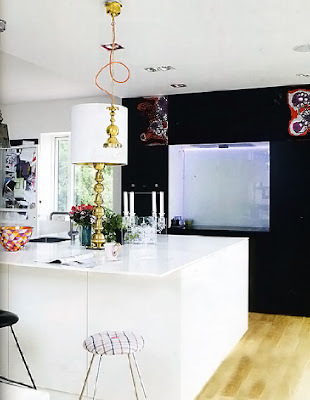 In a small space like an apartment kitchen, spice things up with interesting lighting. There's no reason to stick with what you've got. Interesting lighting can be as easy as adding a great window treatment to enhance your natural light, or choosing a statement tabletop lamp for added drama. Carrie and I are very interested in incorporating a small chandelier into our girly space to enhance our eclectic-feminine style. Ah. BIG dream...not applicable for many years. Has any read this month's Everyday Food from Martha Stewart? The whole sweet section is dedicated to making homemade ice cream. 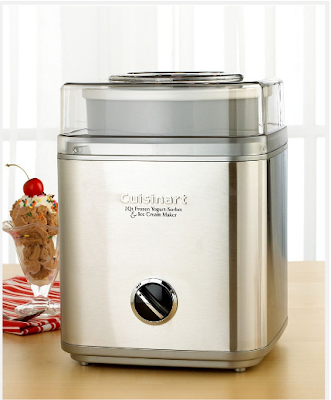 Don't they consider the fact that most people don't own ice cream makers. DUH! 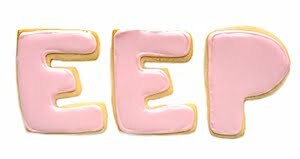 I pledge to find a way (for all of you ice-cream maker-less folks out there) to make delicious ice cream without the fancy equipment. Then when we're 30 years old and have a kitchen full of supplies we can laugh at the days when we made superior sweets without the technology. How did pilgrim's make their ice cream huh? Bet it didn't require an outlet. In saying that, when I'm older an ice cream maker will grace my kitchen counter and olive-oil ice cream, almond ice-cream, strawberry ice-cream etc will flow by the cone! In the meantime, check out some of the awesome granita recipes you can make right in a tupperware container. 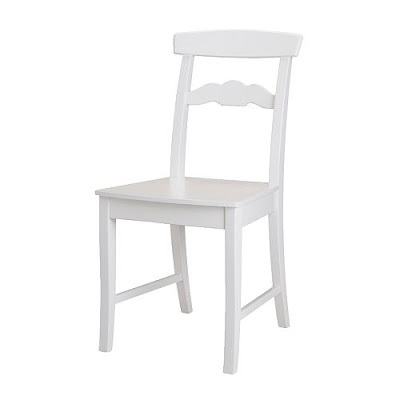 Last, but certainly not least, is the dream of having somewhere to sit in our kitchen. It's been a year of "indoor picnic dinner parties", having guests sit on the floor because the only seating we've had are our desk chairs. Not acceptable. Sometime in the next year, we'll find a way to get a small dining table worked into our kitchen space so that the real adventure is tasting what's on the plate and not in finding somewhere to sit. 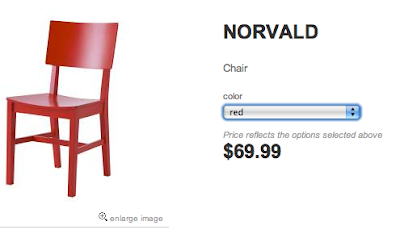 Again, Ikea has some amazing options for tables and for seating. Round tables are easier to use in a small space but CB2 has this amazing fold down table can can fit flat against the wall during the day and expand to fit your guests in the evening. Ahhh now if only we had an apartment to apply this all to. I'll keep you updated as we find a place and slowly make the changes described above. In the meantime, Happy Memorial Day. Shrimp Pad Thai will be posted this evening. Enjoy! This post popped up on my Facebook newsfeed with perfect timing: I spent this weekend decorating the kitchen in my new dorm room in Palladium with Dan (definitely not as exciting as a real kitchen). I too long for a kitchen island and am contemplating investing in one. They're just so expensive! My mom and dad bought me a KitchenAid mixer for my engagement. I got it in baby pink and I adore every minute of mixing with it (and not by hand)! Bed Bath and Beyond occasionally has 20% - 50% off coupons for it. They definitely make the price a bit more manageable. I totally love the blog! Best of luck with your job and your new apartment/kitchen! Check craiglist, occasionally you'll see the islands from Ikea for $10, I know two people who got them that way!